Garden hoses are an essential addition to anyone’s yard, whether you use it for watering plants, washing your car or bathing your dog. But there’s an overwhelming number of hoses on the market, and to help you choose the one that best fits your needs, the ReviewLab team performed extensive research on the different types available. We looked at expandable, heavy duty and lead-free hoses, as well as the best overall and the best value. Each garden hose in our list includes its top features, specifications and other considerations. And our buying guide below includes some key considerations and a price breakdown that will help with your purchasing decision. Read more about our methodology. The features you’ll find in the J. Millman and Sons Expandable Garden Hose, such as the durable hose construction, solid brass fittings and extra accessories, easily explain why it’s our top pick in garden hoses. The Parker PR5825 Garden Hose is another great choice for a durable garden hose that can be used for light or heavy duty jobs. With reinforced rubber and nickel-plated brass couplings, this hose will last for years. A good quality hose doesn’t have to cost a bundle, and the Apex 8695-25 is a great choice for the budget-minded shopper. This all-rubber hose can be used with hot or cold water, and you can’t beat the lifetime guarantee. The Hedgehog Expandable Garden Hose is another great buy with its strong, multi-layer woven outer casing and solid brass fittings. 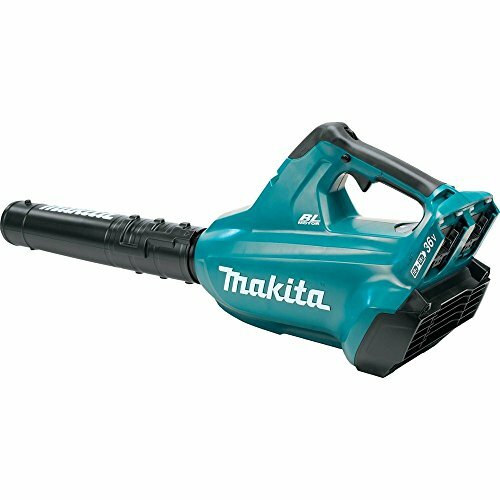 Included with your purchase is a 10-pattern garden hose nozzle with settings from mist to jet. 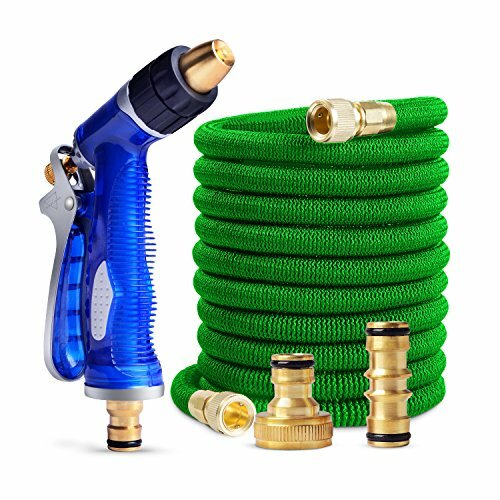 The Shelterin Expandable Garden Hose has many features, such as durable hose material, brass fittings and a multi-setting spray nozzle, that make this an excellent choice for all your watering needs. The eBoTrade Expandable Hose is a great choice for a garden hose that expands to 50 feet and withstands water pressure to 150psi. The one-pound weight makes this hose one of the lightest on the market, and the compact size is easy to store. 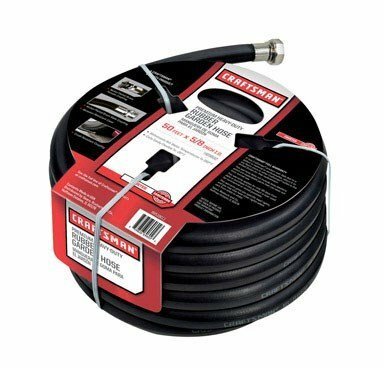 The Craftsman Premium Rubber Garden Hose is an excellent durable hose that you can use for watering your garden, hosing your driveway, flushing the water heater or emptying the pool in winter. The high-quality materials and lifetime guarantee make this a great choice not only for heavy-duty tasks but for any of your watering needs. The Strong 304 Stainless Steel Metal Garden Hose is another great choice if you’re looking for a long-lasting, heavy duty hose. The stainless steel outer casing not only looks nice, but is kink free and withstands extreme temperatures. The Water Right 500 Series High Flow Lead Free Garden Hose is lead and BPA free, making this hose an excellent choice if you need a safe drinking water hose for your RV, boat or other use. The Neverkink 7612-25 Boat and Camper Hose is another great choice if you’re looking for a drinking-water-safe garden hose. It’s made with lead-free, FDA-approved materials, includes antimicrobial protection to prevent mold and mildew and comes with a lifetime warranty. Before buying your garden hose, you should consider not only what material the hose is made of, but also the material of the fittings. Hoses are made from a variety of materials, including , vinyl, polyurethane, rubber and stainless steel. Vinyl hoses are typically the least durable and may not stand up to constant use or exposure to extreme heat and cold without cracking or becoming brittle. They’re also often less flexible and more susceptible to kinking. Stainless steel and rubber hoses and those with multiple layers of reinforced materials last the longest and are more flexible, which helps make them kink-free. The material also determines the weight of the hose. If your hose water will be used for drinking or filling your pool, you should look for hoses labeled “drinking water safe” or “lead free,” which are made from FDA-approved materials. Fittings at either end of the hose also are made from different materials: plastic, stamped from brass sheet, aluminum, stainless or zinc-plated steel and fittings machined from solid brass stock. The latter two are the most durable. Another thing to consider is what tasks you’ll be using your garden hose for. Heavy duty hoses are made with more durable materials so they can withstand more extreme hot and cold climates, and are better for hot water applications. They also have a higher working and burst water pressure. A lighter duty hose should work well for you if you live in a mild climate zone and you’re simply using your hose to, for instance, water your plants or wash your dog. Garden hoses typically come in lengths from three feet to 100 feet, so you should look at the area where you’re going to use your hose and determine the length you need to reach your plants, car, boat or other uses you may have. You also need to consider how you’re going to store your hose. For coiled hoses, you may have to buy a reel, hanger or some other type of storage device. Expandable hoses can provide the length you need while being easier to store. 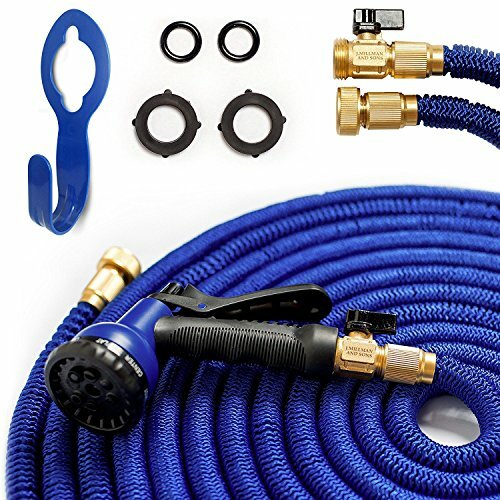 Generally, the length of the hose and the hose and fitting materials will be main factors in the price of a garden hose, but hoses up to 100 feet in length are available for under $20 that include such features as drinking water safe, lightweight and kink free. Some even come with a spray nozzle. For $35 to $50, you can find premium heavy duty garden hoses up to 100 feet long that include solid brass fittings and reinforced hose material that withstands extreme high and low temperatures and have high burst pressure. The J. Millman and Sons Expandable Garden Hose is an excellent choice for a garden hose that’s durable and easy to use. The hose itself is constructed with three inner layers that make it not only strong, but also flexible and kink-free. The expandable 50-foot length and light weight will let you get most of your watering jobs done with ease. And you can’t go wrong with all the extras that come with your purchase, including an eight-pattern spray nozzle. Strong hose material. The J. Millman and Sons Expandable Garden Hose has a three-layer latex inner tube that allows it to withstand a water pressure of up to 145psi. The strong elastic outer layer protects the inner tube and keeps this hose flexible and tangle and kink free. Brass and metal fittings. The connectors and shutoff valve on this hose are constructed of solid brass, the best material for durability. Instead of plastic couplings many hoses use, the couplings in this hose are metal, which ensure the inner pipe connections will have no leaks. Extra accessories. You’ll find all you need with your purchase: the brass connectors, shutoff valve, four extra rubber washers, a hose hanger and an eight-pattern spray nozzle with a comfortable, soft rubber grip. Easy to use and store. Weighing only 2.7 pounds, several users comment on how easy this hose is to use and to carry to different locations. When water flows into the hose, it expands up to three times its length. And when not in use, the hose goes back to its original, compact size, making it easy to store either on the provided hanger or some other storage device. One complaint is the hose tends to tangle after the water is turned off and the hose is reeled back in. The Parker PR5825 Premium Contractor Garden Hose is constructed with materials that make this an excellent choice for either light or heavy duty applications. Rubber is one of the most durable hose materials, and the Parker PR5825 is made from 100% EDPM rubber, which also keeps the hose flexible and kink free. Many users comment on the good reputation of Parker products and, in particular, the high quality of this hose. Commercial-quality hose material. The Parker PR5825 Garden Hose is made with durable 100% EPDM (ethylene propylene diene monomer) rubber with double spiral reinforcing. EDPM rubber benefits include resistance to UV exposure and withstanding extreme temperatures. This hose has a temperature range of -40F to 180F. Rubber also provides a flexible and kink-free hose. Many users comment on the good quality of this hose. Brass couplings. The male x female threaded couplings are constructed of nickel-plated brass, ensuring they won’t be crushed or dented. Heavy-duty use. The Parker PR5825 Garden Hose has a rated working pressure of 125psi (normal working water pressure is 43.5 to 87psi) and a burst pressure of 500psi, making it a great choice for heavy-duty applications. And the o-ring seal ensures water-tight connections. Two reviewers note that this hose is heavier than ones they’ve previously used, though the specifications for this hose say the weight is 4.7 pounds. 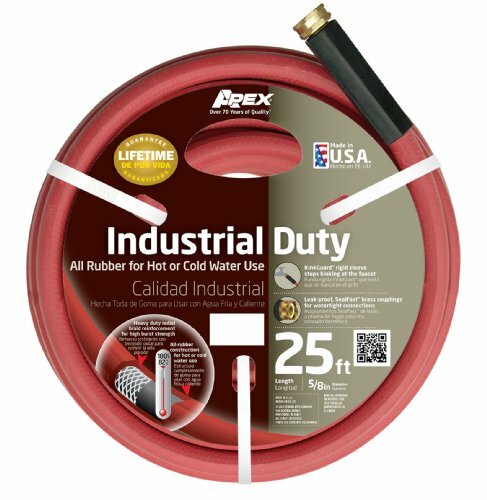 Apex 8695-25 Commercial All Rubber Hot Water Hose is a great choice if you’re on a budget but looking for a durable garden hose. The all-rubber hose material allows you to use it with hot or cold water. Rubber also makes this hose flexible and tangle and kink free. 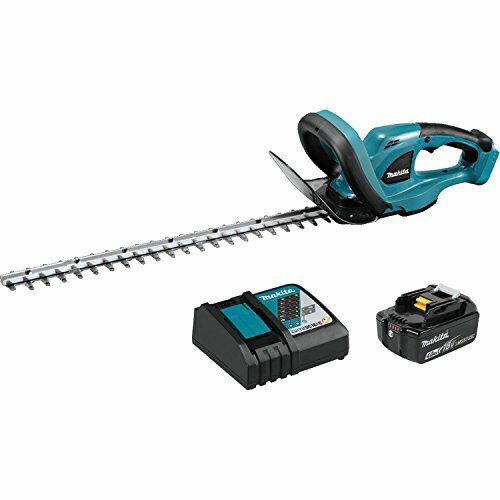 Add to those features a length of 100 feet and lifetime guarantee, the Apex 8695-25 is a great choice at any price. 100% rubber hose. Rubber is one of the most durable hose materials, and the Apex 8695-25 all-rubber construction makes this a hose you’ll have for years. This hose will hold up in extreme temperatures, and you can use it with cold or hot water up 180 degrees Fahrenheit. And many reviewers comment that the Apex 8695-25 doesn’t kink. Heavy duty fittings. The fittings at either end of the hose are machined from solid brass, the strongest and most long-lasting material for hose couplings. And the hose includes a rigid, hard black collar to prevent kinking at the faucet. Length. You’ll get a lot of use around your yard with this hose’s 100-foot length, the maximum length available for most hoses. Lifetime guarantee. Apex provides a lifetime guarantee for this hose when used under normal conditions. The warranty covers defects in workmanship, materials and kinking. Two users mention that the color of the hose quickly faded from red to pink. The Hedgehog Expandable Garden Hose is a great choice for a low-cost, lightweight, yet durable garden hose. This hose has a multi-layer outer casing that will stand up to many uses. It expands up to three times its original length. And, when not in use, its compact size makes it easy to store. In addition, you’ll also get a spray nozzle with 10 different patterns and other features to make your watering jobs easier. Strong hose material. The Hedgehog Expandable Garden Hose has a tough, multi-layer woven casing, which allows it to expand over many uses without cracking or kinking. Solid brass fittings. The Hedgehog fittings are machined from solid brass, which ensures they won’t break, crack or corrode. And the seal is made from heavy rubber to help prevent leaks. Spray nozzle included. 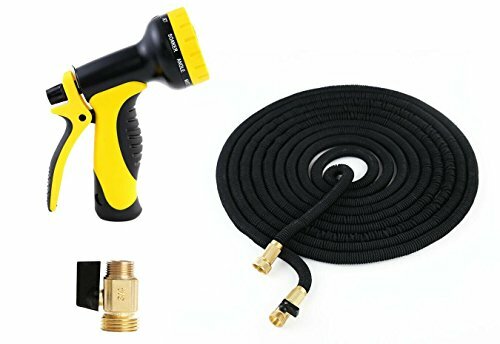 Included in this low-cost garden hose is a nozzle with 10 spray patterns, a switch lock, a flow control and a comfortable, anti-skidding handle. Many users say the spray nozzle is a great addition and makes their watering and washing jobs easier. Easy to use and store. This hose weighs only 1.8 pounds, making it easy to bring to different locations in your yard or other locations. It can expand to three times its original length, and when not in use, it’s easy to store on a hanger or other storage device. One user says he simply drops it into a small bucket. One reviewer notes that the brass hose fitting damaged the threads on his watering timer. Another reviewer says connecting brass to plastic can cause damage to the plastic threads if cross threaded, and perhaps that’s what happened. 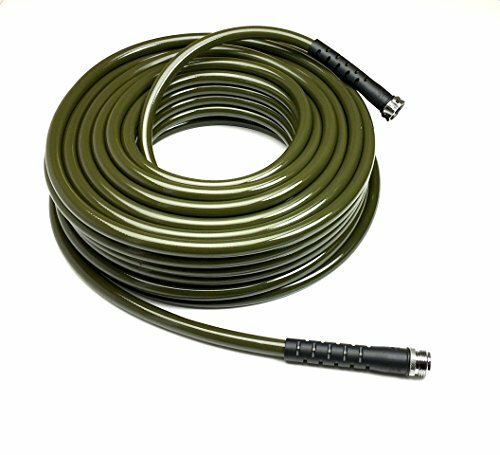 Expandable garden hoses are a great lightweight, flexible and kink-free option. When in use, they typically expand to three times their length. They self-drain and are easier to store than coil hoses. Though some expandable hoses may not be as durable as coil hoses, materials have improved and you can find good quality ones in today’s market. 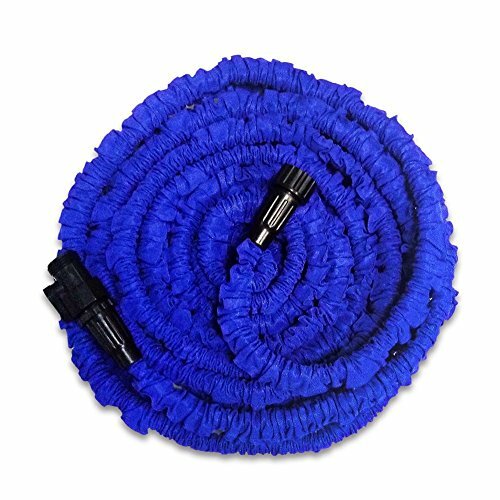 The Shelterin Expandable Garden Hose is a great choice for easy garden watering, car washing, driveway hosing or any other chore that requires a reliable, durable hose. Many users agree on the quality of the materials used in constructing the hose, including the outer latex tube and the solid brass fittings. And the spray nozzle that’s included with your purchase is also made from durable materials with plating to prevent rusting. Durable hose material. The Shelterin Expandable Garden Hose outer latex tube is constructed with high-density polyester knitted casting, making it durable and able to withstand extreme temperatures ranging from -15?F to 115?F and water pressure up to 116psi. The hose expands to 50 feet, and then retracts to its original 17-foot length, making it easy to store in the container that’s included with your purchase. Solid brass fittings and rubber o-rings. The hose fittings machined from solid brass will keep them from cracking or being crushed. Rubber o-rings inserted in the fittings create a tight seal and prevent leaks. Many users comment on the quality of the fittings, as well as the hose itself. Can connect to another expandable hose. A coupling connector, also machined from solid brass and included with your purchase, allows you to connect a second expandable hose for extra length. Spray nozzle included. The Shelterin Expandable Garden Hose also comes with a spray nozzle with different settings making it easy to do all your watering tasks, such as hosing the patio, watering plants and washing the dog. The nozzle end is made with brass, and this as well as the nozzle fittings have anti-rust copper alloy electroplating. The body is constructed with a durable zinc alloy body with chromium plating. One user wishes this hose could be connected to a regular coil hose. The eBoTrade Expandable Hose has some great features to make your watering tasks easier. 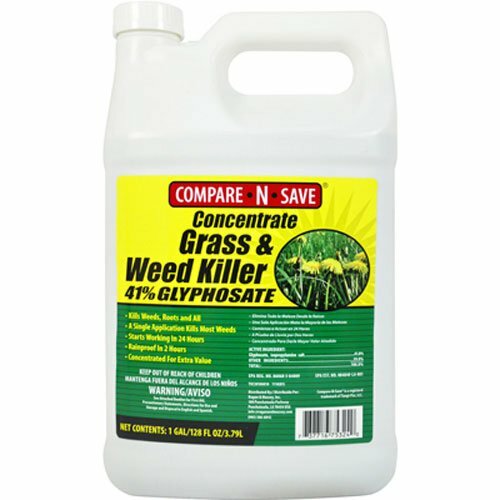 The light weight of one pound makes it convenient to move to different areas of your yard or to other locations. This hose is flexible and won’t tangle or kink, a real plus when it’s expanded to its full 50 feet. And once the hose contracts to its original size, it takes up little room to store. Durable hose material. The eBoTrade Expandable Hose’s inner tube is made with durable 100% natural latex that can withstand water pressure up to 150psi. The optimum working temperature for this hose is 41?F to 131?F, but will handle temperatures ranging from 23?F to 208?F. Easy to use and store: This expandable water hose is flexible and tangle and kink free. It will expand to 50 feet, and, as some users comment, it contracts quickly to its original length when the water is turned off. This eBoTrade hose weighs only one pound, and when not in use, the compact size makes it easy to store. Two year warranty. Most hose manufacturers offer a one-year warranty, but eBo Trade provides a two year warranty for manufacturing defects. The fittings on this hose are plastic instead of brass or other type of metal. Heavy duty garden hoses have high-quality fittings and the hoses are made with rubber or a combination of reinforced materials, which make them the best choice if you’re looking for a durable, long-lasting hose, if you plan to do high-pressure watering or if you live in a climate with extreme high and low temperatures. 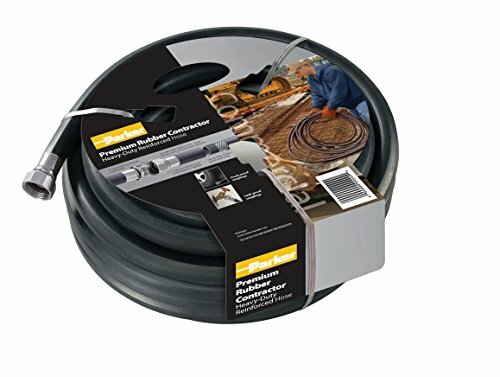 The Craftsman Premium Rubber Garden Hose is an excellent choice for a heavy-duty, durable hose that will hold up in extreme weather conditions while remaining flexible and kink free. With the hose’s reinforced radial tire cord material, you won’t have to worry about ruptures. And the nickel-plated brass fittings are crush and corrosion resistant. Craftsman has a reputation for producing superior products, and many reviewers comment on the high quality of this Craftsman garden hose. Durable hose material. This Craftsman hose is made with reinforced radial tire cord, making it extremely durable with a 500 psi burst pressure. It can withstand water temperatures from -25°F to 160°F. This hose will also remain flexible and kink free when used under extreme hot and cold weather conditions. Crush-resistant fittings. The fittings at each end of the hose are nickel-plated brass, which will keep them corrosion free. They’re also crush resistant and easy to connect to faucets and sprayers without the need for pliers. Flexible and kink free. Rubber hoses are naturally more flexible and kink-free, and this Craftsman hose is no exception. Some reviewers note that this hose is easy to wind onto a hose reel since it doesn’t tangle or kink. Lifetime guarantee. Craftsman provides a full lifetime warranty for this hose when used under normal conditions. One reviewer tells how he ran over his hose with his riding mower, and Craftsman replaced it, no questions asked. This hose weighs 10 pounds, and some reviewers say it’s heavy to use, though others disagreed. The Strong 304 Stainless Steel Metal Garden Hose will hold up in extreme climates, with a temperature range of 14? to 122?. The stainless steel also makes this hose very flexible and it won’t kink or tangle, and the metal casing can’t be punctured. This hose is an excellent choice that covers all your watering uses, including any high pressure applications such as hosing your driveway or boat. The proof is in the high-pressure fireman nozzle that comes with your purchase. Durable hose material. The Strong 304 Stainless Steel Metal Garden Hose has a PVC inner hose and a heavy duty, durable 304 stainless steel outer casing. The stainless steel makes this hose UV and corrosion resistant and able to withstand high-pressure hosing jobs. It can withstand temperatures ranging from 14? to 122?, so it’s a great choice if you live in extreme hot or cold climates. You may think a metal hose will be heavy, but the Strong stainless steel hose weighs only 4.7 pounds. Flexible and kink and puncture resistant. 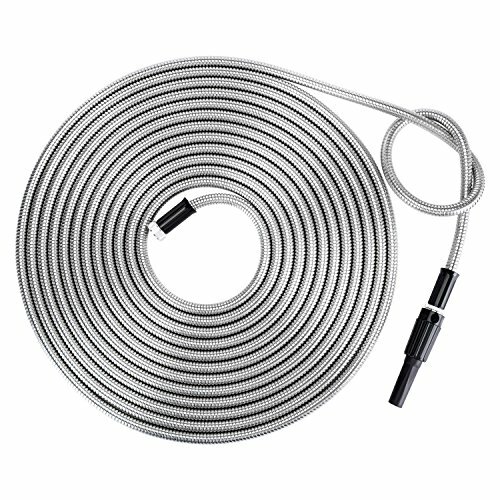 The stainless steel casing and the light weight of this hose make it very flexible and kink and tangle free. And unlike vinyl or some rubber hoses, this hose can’t be torn or punctured. High-pressure nozzle included. Included with the purchase of the Strong Stainless Steel Garden Hose is a high-pressure fireman-style nozzle with adjustable water flow. Though one user says this is a good hose, he wishes it had all metal instead of part metal and part plastic fittings. If you’ll use the water from your garden hose for filling your pool or for drinking, for instance with your RV or boat, you’ll need to look at hoses that are made from FDA-approved materials. The inner cores of these hoses are free of lead, BPA and other toxic chemicals. The Water Right 500 Series High Flow Lead Free Garden Hose is an excellent choice for a drinking-water-safe hose. If you’re looking for a hose to use in your RV or boat, to fill your swimming pool, or you know your kids will be drinking from the hose, you can feel confident that the Water Right hose is safe. It’s made from FDA-approved polyurethane that’s UV stabilized and 100% lead and BPA free. Brass fittings. The durable fittings at either end of this hose are machined from solid brass and plated with chrome to eliminate corrosion. The fittings also have strain reliefs to prevent the hose from kinking at the faucet or nozzle ends of the hose. Flexible and lightweight. The polyurethane material of this hose is soft and flexible, and remains so down to 32°F. This Water Right hose weighs only 2.4 pounds, making it easy to move around your yard or transport to your boat or RV. A few reviewers note that this hose is difficult to wind onto a hose reel or holder. If you’re in the market for a drinking-water-safe garden hose, you have a great choice in Neverkink’s 7612-25 Boat and Camper hose. This hose is made with lead-free, FDA-approved materials, and the fittings are machined from solid brass. Its light weight of 2.8 pounds makes it easy to move the hose around your yard or to carry it to your boat, camper or RV. Add to these features the manufacturer’s lifetime warranty, and you can’t go wrong with this drinking-water-safe garden hose. FDA-approved materials. 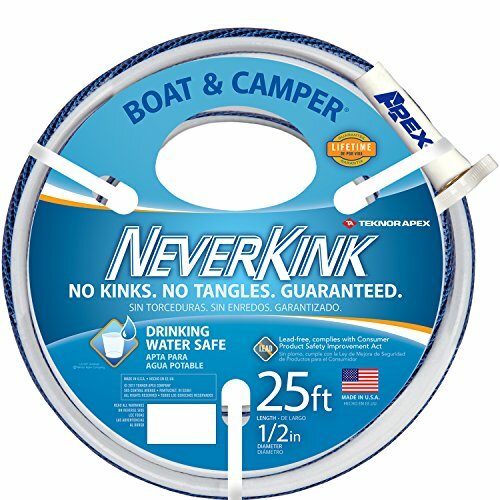 The Neverkink 7612-25 Boat and Camper Drinking Water Safe Hose is made with lead-free, FDA-approved materials and complies with the Consumer Product Safety Improvement Act. This hose also contains Neverkink’s MicroShield, which guards the hose against mold and mildew. Kink and tangle free; lightweight. This Neverkink hose uses an outer strip consisting of a mesh network that prevents kinking, twisting or tangling. And its light weight of 2.8 pounds makes it easy to move from your front to back yard, or to transport to your boat or RV. Brass Fittings. The durable hose fittings are machined from solid, crush-resistant brass, which provides a tight, leak free connection. Over the brass female coupling is a plastic ThumThing that makes attaching the hose to a faucet and tightening the fitting easier. Lifetime warranty. Apex, the manufacturer of Neverkink hoses, offers a lifetime warranty to the original buyer and if the defect happens under normal garden hose use. One reviewer explains that when his hose leaked at the female end, Apex replaced the hose promptly once he provided a copy of his receipt. This hose is not designed for hot water use.